I was late to work today. I have an excuse, two of them actually. 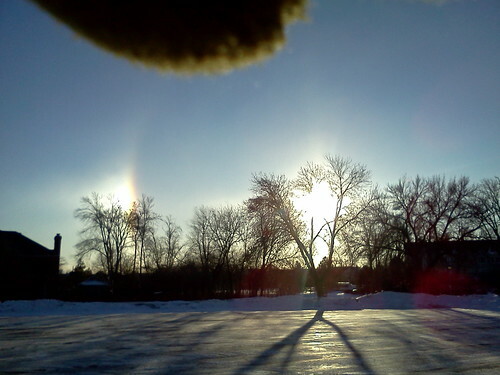 These are sundogs and are created when ice crystals are in the air. I'd seen several photos this winter during the weather segment on the local news but had not seen any myself. I'm more familiar with the ones that show up in the evening. 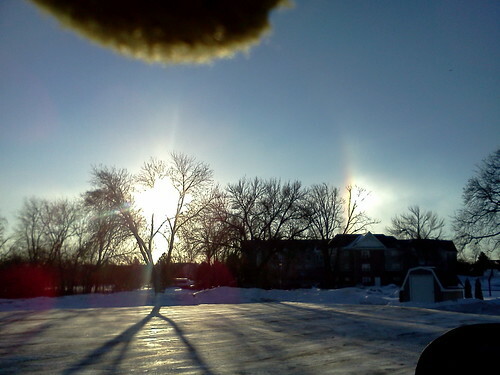 That yellow blob at the top is my gloved finger holding the cell phone camera. I couldn't find my regular camera in my purse so I decided I'd just use my cell phone. I'm less sure where my hand is when I use that camera. Of course, when I got to work, my regular camera was in the bottom of my purse. It might be Monday and it might be a -5 with a -20 wind chill, but these were just beautiful. An impressive way to start the work week.